I ask myself: Why am I still a Hindu? Because it is difficult for a Hindu not to be a Hindu. Because it is a religion, which is not based on books, but on discourses. In Hinduism, the ins and the outs are not clearly marked. It is a religion without central tenets, prophets and core prescriptions like the Islam or the Christianity. I cannot be a Muslim if I don’t believe in the Prophet or I cannot be a Christian if I do not believe in Christ. I can be a Hindu even if I don’t read certain important texts (like the Bhagwad Geeta or Tulsidas’ Ramayana or some such texts). I can be a Hindu even if I don’t go to temple or believe in God. The best thing and the worst thing about Hinduism is that there is no Hindutva. It is the best thing because it is difficult for the few powerful people, like priests or politicians to hijack the entire religion for their purposes by usurping the core elements. It is the worse thing because there is no fixed centre to provide moral and spiritual anchoring. Some critics may think that this is a very good thing, this lack of centre, and celebrate this centrelessness in a Nietzscheian way. However, I believe that it is precisely because of this lack of unambiguous central moral elements that there is unbridled corruption in our society. We end up having a society, which does not have conscience. Dr. Ambedkar and certain Leftist thinkers believed that if you denounce Hinduism you are able to get rid of it. I wish it were that simple. Along with tyrannical and repressive aspects of Hinduism, like casteism or androcracy (a better word than patriarchy? ), you also have more democratic and open elements which allow you to critique or denounce the repressive elements. One can see the Bhakti poetry as an example of assertion of more demotic and liberal elements of Hinduism. In fact, you can be democratic even by evoking God, as in Kabir or Meera. In fact, this combination of non-democratic with the liberal components is what makes Hinduism so exasperating. It becomes difficult to be Hindu in entirety and it becomes even more difficult to jettison the whole historical cargo. The step outside Hinduism is not easy one to make. One can remain within this unwieldy inheritance, in a Derridian fashion, and continue to read the tradition against grain by emphasising the demotic and liberal elements of Hinduism, by amplifying the contradictions within the inherited set of beliefs and complicating the whole issue. One can be a good Hindu by relentlessly asking what Hinduism is and problematizing the unequivocal responses to this question. By continually reminding people that that there is no Hindutva alone, can I be a good Hindu. I can be a good Hindu only by reminding others and myself that there is no the Hinduism but Hinduisms and that there is no single version that is acceptable to all Hindus. When the news of Baba Amte's demise reached me yesterday morning, I was brushing my teeth and was in a usual hurry to reach college. I didn’t know how to react. I hadn’t met Baba in decades. 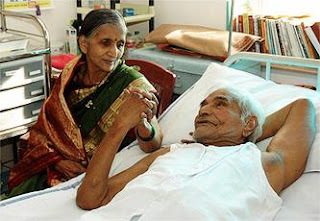 My father who worked as a personal assistant in Cynamide India, now something called Wythe-Lederly, took what is these days known as `voluntary retirement' to join Anandwan, the great institution for leprosy patients and other physically challenged people, started by Baba Amte to render his honorary social service. My father was a pen friend of Dr.Vikas Amte, Baba's son who was chiefly in charge of the institution. My father assisted Dr Amte with institution's correspondence and also used his knowledge of homeopathy in service of the leprously patients. He stayed there from almost five years. I distinctly recall that it was during our first visit to Anandwan in 1984 that we heard the news of the assassination of Mrs. Gandhi. I also recall that it was during this visit that I developed what my parents termed euphemistically as `breathing problem'. I was twelve, on the threshold of teens. The stress of the disturbed family environment and the onset of puberty was probably the reason why my chronic cough and cold degenerated into asthma. Another significant reason for its deterioration was very high temperature in the Vidarbha region of Maharashtra. It used to be close to 45 degrees centigrade. Thanks to my asthma and my mother’s dislike of my father’s decision, I returned to Valsad with my mother. I stayed with my mother in Valsad for around five years. Along with the agony of asthma, this was the period of great insecurity and loneliness for me. Dad returned in the early nineties after Baba Amte left for Narmada to start anti-dam movement. I stayed for only around a year in Anandwan, the forest of joy and the memories of my stay there are very vivid and alive in my mind. As there was no school which had English as a medium of instruction close by, I had to travel for around twenty kilometers. I got admission in the Kendriya Vidyalaya, ordnance factory, Chandrapur. Mr. Patwardhan was a government engineer and a friend of Dr Vikas Amte. His daughter Ashwini Patwardhan was also going to the same school and I went in their jeep to a petrol pump near Warora, from where I used to get the Western Coalfields school bus for the school. I remember my first crush on a girl named Ipsita who used to go by the same bus. I remember that I made friendship with chaps like Santosh Srivastava and others. I also remember being bullied and ridiculed by some of the students. I also remember failing in my Hindi tests. I also remember loathing this thing called ` SUPW’, an abbreviation of Socially Useful and Productive Work. I discovered that I could never be socially useful and productive work and so I turned to poetry in this period. Baba Amte read one of my early poems on `nature’ and remarked prophetically to my dad that I would never be a doctor or engineer. I, however, did manage to become a doctor, not of medicine, but of poetry. I recall that Dad used to accompany me as I cycled down to the gates of Anandwan to get Patwardhan’s jeep. The gate was a couple of kilometers from the office and the quarters where we stayed. People laughed at the sight because I was so pampered and protected by Dad. Most of my time in Anandwan was spent among dogs of various breeds, and I have reasons to suspect that my caninophilia was in some ways responsible for aggravation of allergy. I loved to play with dogs there. I could play with a Lhasa Apso terrier, a Great Dane named Rani, and many Spitz among other breeds. I would play for hours with them, much to amusement of the inhabitants of Anandwan. Baba Amte was a legend in his own times. We endlessly heard stories of a man named Murlidhar Devidas Amte, born with a proverbial `silver spoon’, fond of poaching, sports cars and correspondence with Hollywood actresses, suddenly transforming into a committed social worker after renouncing his life of luxury after his encounter with a leper. Baba and his wife Sadhanatai were a source of inspiration for thousands and he changed the life of thousands who came to him for help. Anandwan, or the forest of joy, was a huge institution working with the motto that `charity destroys’. The aim of Baba’s work was to make the weakest and the lowest of the low in our society self reliant and self sufficient. He treated thousands of leprosy patients, and the physically challenged people and made them capable of earning their own living instead of begging. Anandwan is a place everyone has to see to believe. Baba’s larger institutional network was the Maharogi Sewa Samiti with its branches in interior forest areas of Hemalkasa and Nagapalli and Somnath. Baba’s son Dr Prakash Amte and his wife Dr Mandakini Amte worked with equal passion and zeal for tribal population in Gadchiroli district of Vidarbha. My visit to Hemalkasa then is equally memorable. I saw Dr. Prakash among panthers, bears, branded kraits and other wild animals given as gift by poor tribal people in exchange for the treatment given by the Amte’s. I also remember a tiger attacking me from his cage when I went too close to the cage to see how he ate. Tigers, as I learnt after being scratched on shoulders, don’t like people watch them while eating. I also recall my experience of the annual get-together of people at Somnath and my hunting of chameleons there. My life in Anandwan comprised of playing cricket near what was called `Muktangan’ open air auditorium built from the donation given by the well-known Marathi humorist Pu La Deshpande with Dr Vikas’s son Pilu Amte, now Dr. Pilu Amte, and Munna. Sheetal, Pilu’s sister, now Dr. Sheetal, was a very naughty creature around. She used to tease Baba by calling him Gadge Baba! We used to have meals in a common mess and we had to wash our own plates. This was also the period of rise of terrorism in Punjab and Baba very prophetically felt that the country is going to pieces. A great freedom fighter that he was, he was disturbed by the state of affairs and he started what was called ` Bharat Jodo Abhiyan’- Link India movement. There was a cycle rally from Kashmir to Kanyakumari . Nanda, my sister who was older to me by eight years was involved in making posters for the Cycle rally. There she met Shirish Kathale, an artist and school teacher in the blind school, fell in love and they were subsequently married. My mom disliked the idea of coming to Anandwan and the idea of her daughter’s marriage. This added to the family disturbance that we already had. My memories of the marriage ceremony is that I preferred to keep away from the whole celebrations, chiefly out of shyness and also due to strange complexes which I haven’t been able to understand myself. Did I disapprove of the marriage? I don’t think so because I liked Shirish myself and we always were on my dad’s side. It is something of a mystery for me even today. As time passed, Nanda and Shirish found out that they were unable to work there for longer time due to some differences with the authorities. My dad invested whatever money he had from his premature retirement to support Shirish and Nanda’s business venture. The business venture was a proposal from one Mr. Sohoni, a colourful character, to illustrate for children’s books for the well known company called Navneet. Mr Sohoni took the money and vanished and the proposal sank. This added fuel to fire in our disturbed family. It was a great blow for us all. Probably, India as a nation-state is too old to rise to the occasion, it has become senile and dysfunctional. That too in the times of late globalization. Sania Mirza refuses to play in Banglore Open as she is afraid of more fatwas and controversies. The Secular Republic which could not protect the poor innocent Muslims of Gujarat is incapable of protecting one of the best tennis players in the country from religious fundamentalists. A student in Patan, one of the famous towns of Gujarat, was gang raped repeatedly and the gang consisted of none others than her teachers! This is our lauded `Guru Shishya Parampara'. The state is unable to protect anyone it seems. The poor North Indian immigrants in Mumbai are targetted by the members of a political party headed Raj Thackeray who is trying to imitate his illustrious uncle in fanning anti-North Indian sentiments. Dozens of children and women in Nithari, a place near Noida were raped and killed and probably eaten and the Hindustan Hamara watched helplessly in horror. Pogroms and riots of Gujarat in 2002 or Nandigram violence, what emerges is the face of the nation which is simply incapable of protecting anyone. India Shining? I think we are living in one of the most insecure periods in the history of India.